Who can jump start my car battery at my house? Fast T's Mobile Battery Services can jump start or boost your battery, test it, or even change it out at your location! I already have a battery I bought, will Fast T's install customer bought parts? Yes, Absolutely! We will install customer batteries, even if they purchased it themself. Your Fast T's Battery Tech can also aquire a new battery for your car from one of our many car battery suppliers at no additional cost. Who does Battery Testing, Jumpstart/Battery Boost, & Battery Replacement/Battery Installation On Site? 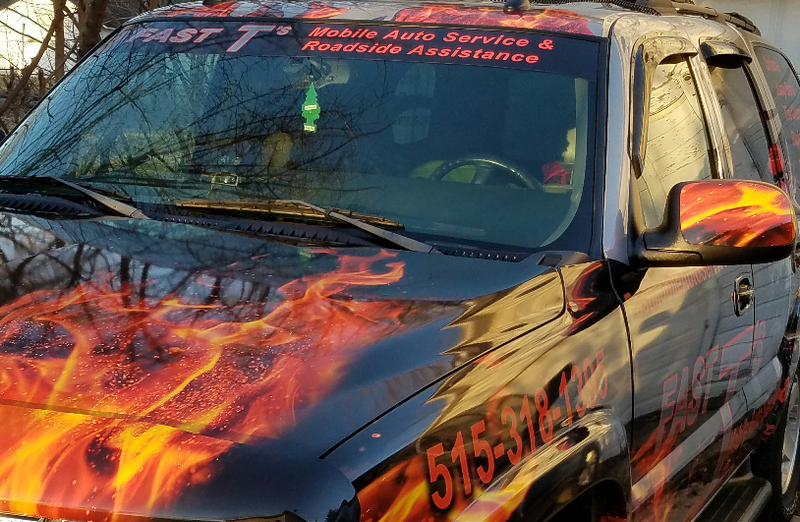 ​Fast T's Mobile Car Battery Services Replaces Batteries on Most Makes of Cars & Trucks! No problem, Fast T's On Site Mechanical Experts can diagnose the problem, Test, & Replace the Alternator if needed! Does Fast T's have a warranty? We have one of the best car repair warranties in our class. Our 12,000 mile/2 year Parts Replacement Warranty, and Labor Guarantee, ENSURES that you can "Put Your Mind at Ease!" with Fast T's. Yes, Fast T's provides our Services, and Repairs On Site where you are. At Home or the Grocery Store? No problem! Our Auto Repair Shop on Wheels is mobile, and we have permission to repair cars at almost every business in town! I'm not sure if my battery is dead, but it will not start! If it is not the battery, can you still help me? Yes, your Fast T's Automotive Technician will isolate the fault by testing, and performing a thorough diagnostic; thereby identifying the true problem or fault, that caused your vehicle not to start or crank. Most forms of payment are gladly excepted including Credit, Debit, Android Pay, Apple Pay, and Cash. The only form of payment not accepted by Fast T's is checks, mainly due to the liability. Are you full service? Can you provide everything On Site? Everything we provide is at your location, and we are limited by the fluids that we can completely contain and clean up, and by manufacturers specs. If it can be provided properly according to OEM Specifications On Site, then yes we are glad to provide the service or repair for you. If it can not be done properly On Site, and within local regulation limits, we have partnered with many other local Auto Repair Shops to provide your automobile service correctly. My car is in the garage, can you still get the battery boosted, or jump started? Yes, Fast T's has state of the art Portable Power Units to provide instant voltage, and amperage to your cars battery. In a garage or parking ramp, NO PROBLEM, WE CAN jump start car batteries without jumper cables! My check engine light came on, can you help me? Absolutely! We have computerized diagnostic scanners to communicate with the on board system's of your car or truck, and read the fault codes in your Engine, ABS or brakes, Transmission, Drive Train, Charging System, and MORE! What if it needs a new starter? Can that be installed by you? Yes, first we test the starter to ensure that it has failed, then we remove and replace it on location at your home, office, parking lot, mall, grocery store, or place of breakdown. If you can't fix it, do I still have to pay? No, if Fast T's Mechanic or Technician is unable to provide the proper fix, or solution to your vehicles problem, there is no charge if we can not help you and your car On Site! I think it's an easy fix, will there still be a fee for Mechanics labor? No, if we are able to get your car or truck fixed in under 15 minutes, you pay only a Service Call fee.